Following on from participating in the From the Red Carpet film club for Looper and Premium Rush, I joined in again for the discussion of latest James Bond flick Skyfall. Check out the From the Red Carpet review of Skyfall here. Adele's theme is a classic and the opening credits were suitably morbid and beautiful. 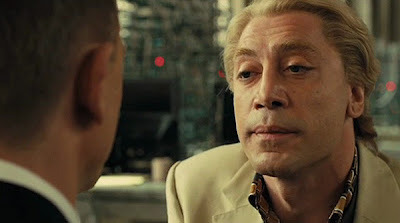 Bardem made a hugely satisfying baddie with a standout scene that made me care more for him than any other Bond villain in history and finally the other cast members slotted into place in very exciting ways for the future of the franchise. I had hoped for the ending to get more emotional but this is a minor complaint. What I most loved about it was how it went from such huge epic globe-spanning stuff at the start to an incredibly personal and restricted story by the end. I leaned more about Bond than ever and setting the action in one location for much of the final half was genius. I hope Sam Mendes will be back for more. In other news, please go vote for The Master to be this week's film club pick as otherwise it's Twilight! What did you think of Skyfall everybody? Feel free to post links to your reviews in the comments!